Raja Ampat has all the requirements to become the world's best destinations. Small islands and underwater beauty tempting. Essence of the beauty of Raja Ampat, Indonesia located in Wayag Islands. 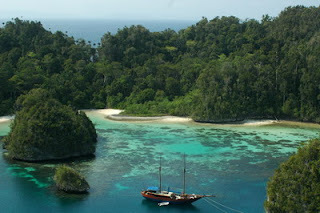 Blue waters with coral reefs are clearly visible beneath it, will you can take while enjoying the Raja Ampat. If the underwater diving, marine fish are pretty will welcome you. Wayag islands situated in the village of West Waigeo, Raja Ampat regency, West Papua. Of Sorong, the journey takes up to 6 hours by hiring a clod. The journey is hard and quite a drain on your wallet, but the beauty of the Islands Wayag, really fascinating. Wayag Islands consist of clusters of small islands. The small islands are coral islands are overgrown with trees. When wading through the islands by boat, you'll be hypnotized by a sea of ​​turquoise, coral reefs and the fish are clearly visible under the water, as well as beautiful scenery with a beautiful blend of sea and small islands of interest. There is one place you must visit while in Wayag Islands, the Coral Island. Not underwater beauty, but you have to climb to the top of the island. With a slope close to 90 degrees, you will spend about 30 minutes to arrive at its peak. Stamina and physical strength is needed. What's on top? Coral islands and ocean blue eyes would look through your view. Common sight you see on the internet or television, there is now in sight, even as the palm of your hand. From the top of the level, coral islands will be obvious to you. If the sun is hot, will add to its charm due to coral reefs in the sea into its own color. green and blue color dominates the surrounding seas. Prepare the camera, because this is a very rare moment! This perfect scenery, making it as the core of the beauty of Raja Ampat. The scenery can not be described in words, will you never cease to be amazed and astonished. Wayag Islands can be a sweet dessert when you visit the Raja Ampat. Charm will make your trip to Raja Ampat more perfect. 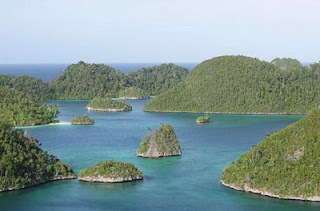 Let a vacation to the Islands and enjoy the charm Wayag Raja Ampat.